The Beehive House, located in Salt Lake City, Utah, served as President Brigham Young’s primary residence from 1855 until his death in 1877. 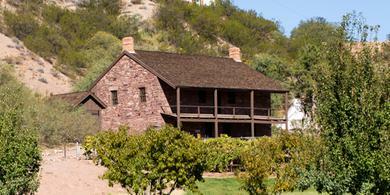 From 1870 to 1877, President Brigham Young lived in St. George, Utah, during the winter months. Beginning in 1872, he and members of his family lived in the place that is now called the Brigham Young Winter Home. From this home, he directed the affairs of The Church of Jesus Christ of Latter-day Saints. 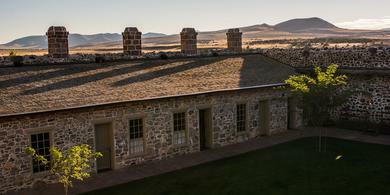 Today this historic site is open to the public year-round. The home and adjacent office have been restored and furnished to reflect their 1870s appearance. Tours tell about Brigham Young’s family life in St. George and about his role in directing the settlement of southern Utah, including the construction of the St. George Utah Temple. For information about visiting the Brigham Young Winter Home, click or tap here. Brigham Young purchased this home in 1872. He remodeled it, doubling its size to more fully meet his needs. While living here, he continued his regular work of administering the Church, including overseeing the construction of the St. George Temple. As the completion of the temple neared, he built an office adjacent to the home. The office provided privacy for him to meet with selected Church leaders to reinstitute temple ordinances that had not been performed in a temple since the Saints left Nauvoo, Illinois. The St. George Tabernacle in St. George, Utah, is a historic meetinghouse of The Church of Jesus Christ of Latter-day Saints. 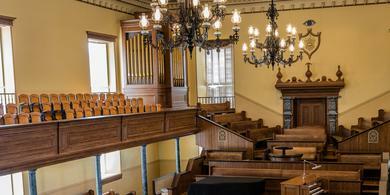 It has functioned as a place of worship and a place for community gatherings since 1869—before its completion in 1876. It is also open for public tours. Guided tours highlight features that illustrate the faith, unity, artistry, and industry of the Latter-day Saints in their efforts to create a holy building where they could worship God. Exhibits display artifacts used in the construction and ornamentation of the building. 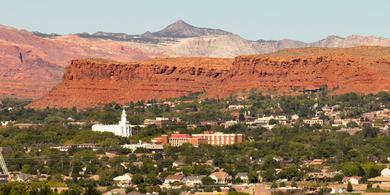 For information about visiting the St. George Tabernacle, click or tap here. Not long after the establishment of St. George, Brigham Young directed settlers to construct a building where they could worship. They began construction in June 1863, using local red sandstone and labor that was either donated or funded by their tithing donations. Settlers from all over southern Utah Territory either worked on or provided goods for the tabernacle’s construction. They completed the tabernacle in 1876. Concerts, community celebrations, Latter-day Saint and non–Latter-day Saint worship services, special conferences, memorial services, and other events have been held here. For more information about the history of the tabernacle’s construction and use over the years, click or tap here. The St. George Tabernacle is an example of 19th-century Latter-day Saint tabernacle building. Latter-day Saints no longer build tabernacles. Like modern stake centers, tabernacles served large geographic areas and multiple congregations and provided a large primary worship space. Unlike modern stake centers, tabernacles did not include smaller rooms for religious instruction. From 2016 to 2018, the St. George Tabernacle received structural updates, and the interior and exterior were restored to their 19th-century appearance. The Jacob Hamblin Home in Santa Clara, Utah, is the place where Jacob Hamblin, Southern Utah Indian Mission president, lived with his family from 1863 to 1868. Because of Hamblin’s service among the American Indians in the region, the home functioned as the headquarters for the mission. Today it is a historic site and is open for public tours. 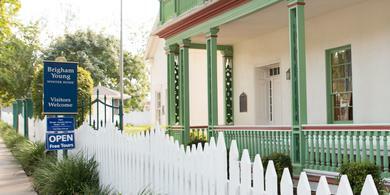 The home and furnishings have been restored to reflect their 1860s appearance. Tours of the home tell about Hamblin’s lifelong dedication to serving American Indians and about his family and their life on the frontier of southern Utah Territory. For information about visiting the Jacob Hamblin Home, click or tap here. In 1854 Brigham Young called about two dozen men, including Jacob Hamblin, to serve in the Southern Utah Indian Mission. Initially the mission was headquartered in New Harmony, Utah, but lack of water necessitated the move to Santa Clara. While in Santa Clara, Hamblin and other missionaries worked with Paiutes in southern Utah and Nevada. Hamblin’s missionary efforts required living among the Indians. As a result, he spent most of his time away from his family. He viewed his mission as a lifelong calling. In 1869 he and his family moved to Kanab, Utah, where he continued his proselytizing efforts among the Hopi in southern Utah and Nevada and among the Navajo in Arizona. The home provided accommodations for Hamblin’s large family. His wives Rachel Judd and Sarah Priscilla Leavitt accompanied him on his mission to southern Utah. At the time they moved into the home, the family included six children. Sarah bore three additional children while living in Santa Clara. Rachel passed away while the family lived here. Jacob married Louisa Bonelli in 1865. She bore one child while living in Santa Clara.